World champion Thor Hushovd has spoken of his frustration with the Alberto Contador case, saying that he finds it perplexing that it is taking so long to reach a final decision on the matter. The Spaniard tested positive for Clenbuterol during last year’s Tour. Despite the fact that almost a year has passed, the Court of Arbitration for Sport recently announced that more time is needed after Contador’s lawyers requested an extension. This was agreed by the appellants, WADA and the UCI, and the hearing will now take place between August 1st and 3rd. “Obviously it's frustrating. Especially in the sense that no one - including us cyclists as well - can understand anything,” Hushovd told the Dagbladet newspaper. “We do not understand why a decision can not happen…can not you just give a yes or a no? The case should have been finished by now. He also points out that if he loses at CAS, there is uncertainty about whether he gets to keep his wins since last year’s Tour, nor not. Some riders have said that they believe Contador, giving him their unconditional support. Hushovd’s stance is different, with the big Norwegian saying that he believes the Saxo Bank SunGard rider should be sanctioned if it is found he is at fault. 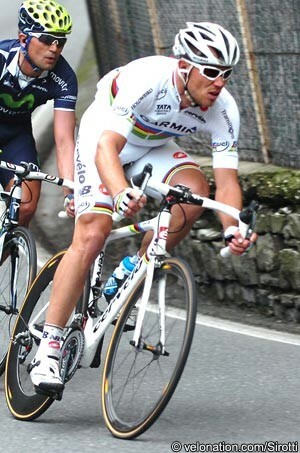 On a personal level, he is hoping that the Tour de France helps him to turn the season around. He won the world road race championships last autumn and since then has worn the rainbow jersey, but has not yet managed to win a race in those colours. That’s been frustrating for him, but he promises to work hard between now and the Tour start. He said that his general condition has been good in the spring, but that the results just didn’t come. He’ll keep building, and has clear targets in mind. The Garmin-Cervélo team for the Tour will be finalised closer to the July 2nd start date.